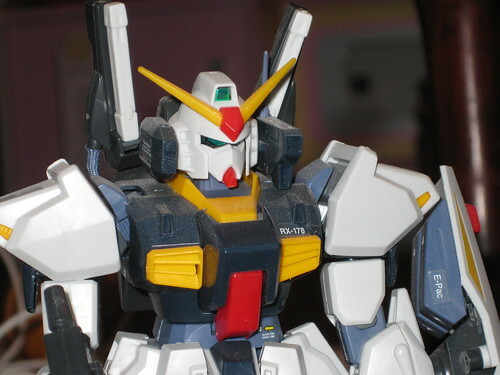 RX-178 MkII, originally uploaded by AndyBartlett. I dug two of my remaining Bandai Master Grade Gundam models out of the basement tonight; this is my RX-178 MkII. I also pulled out the mecha and backpack for my Nu Gundam (but none of the weapons). Photos of the Nu and another picture of the MkII are up on Flickr; you can check them out in the sidebar or by directly visiting my toy collection gallery on Flickr. I’m going to try and draw a bunch of pictures of these over the next few days and use their structure as a base for the Transformers pictures I’m also working on. Even though these models don’t have a tremendous amount of detail, working out some of the basic mechanical features and proportions will be hugely beneficial to my Transformers efforts. The Mark II in particular will be a great model to work from, as it’s bulkier than the more-athletic Nu Gundam.